Edit - Extended until Tuesday, April 17! You still have time if you want to redeem! 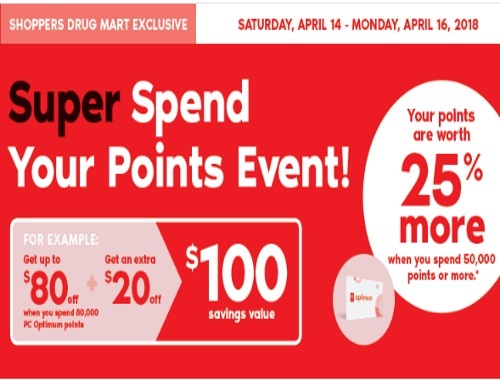 Shoppers Drug Mart has a Super Spend Your Points Event! Your points are worth 25% more when you spend 50,000 points or more. For example: Get up to $80 off when you spend 80,000 PC Optimum points, plus get an extra $20 off = $100 savings value. Only redeemable at points level of 50,000 points or more and in increments of 10,000 thereafter, in a single transaction. Offer is valid Saturday, April 14-Monday, April 16, 2018.